They’ve always been a crew of characters. Mick Fleetwood, the wild-eyed co-founder and beat keeper. Lindsey Buckingham, the perfectionist artiste with the gift for guitar. Stevie Nicks, the mystical Glinda the good witch and poet. John McVie, the stoic root of the rhythm section. Even Christine McVie, before she departed Fleetwood Mac in 1998, played the part of the classy Brit whose keyboards added lushness and sweetness to the band’s sound. Though Fleetwood Mac has toured sporadically during the past 15 years, it wasn’t always convincing that they were squeezing onto planes and tour buses and stages for anything other than a paycheck. But now, after even more years of solo projects and time spent apart, it’s apparent that there is genuine affection tying the onetime soap opera-etic Mac together. Buckingham and Nicks almost always entered the stage at Philips Arena together, holding hands like the king and the queen of the prom – the roles they’ve always filled within the band. The songs from “Rumours” – seven of the 11 tracks from their landmark album made the live cut – at one time stung with hurt and betrayal, showcasing the most dysfunctional band in rock. But as Nicks and Buckingham joined voices during the ominous creep of “The Chain,” with Fleetwood’s rattling snare drum bumping the song along, and Nicks unleashed her throaty warble on “Dreams,” the songs now sounded like beautifully constructed couplets from a musical era never to be duplicated. The music is as potent as ever, even if the impetus behind the lyrics has softened. For 2 ½-hours on Monday, Fleetwood Mac enchanted a sold-out crowd at Philips – mostly happy middle-agers thrilled to see the gang one more time, or maybe for the first time – and unveiled a comprehensive, 23-song set list. Since it’s the 35th anniversary of “Rumours,” favorites from the album – the opening “Second Hand News,” the grungy guitar shadowing “Gold Dust Woman,” the aggravated kiss-off “Go Your Own Way” among them – took center stage. However, one thing Fleetwood Mac can brag about is recently releasing new songs (on the digital EP, “Extended Play”) that are well-suited for the band’s canon. 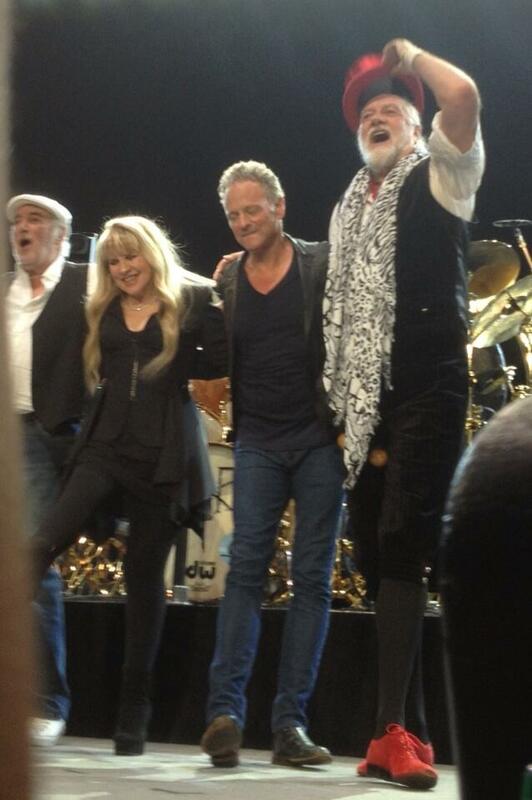 “It appears there are a few chapters left in the book of Fleetwood Mac,” Buckingham crowed from the stage. “Sad Angel” is a driving pop rocker featuring those trademark Buckingham/Nicks vocals, while the “Peace Train”-like “Without You,” an unearthed demo from the pair, chugged along appealingly. As for the rest of the hits, yes, some keys were modified to suit aging voices, but it was still a treat to hear “Rihannon,” perfectly complemented by images of a colorful moon on the high-def screen stretching the stage, and “Sisters of the Moon,” a song Fleetwood Mac hadn’t played live since 1981 prior to this tour. 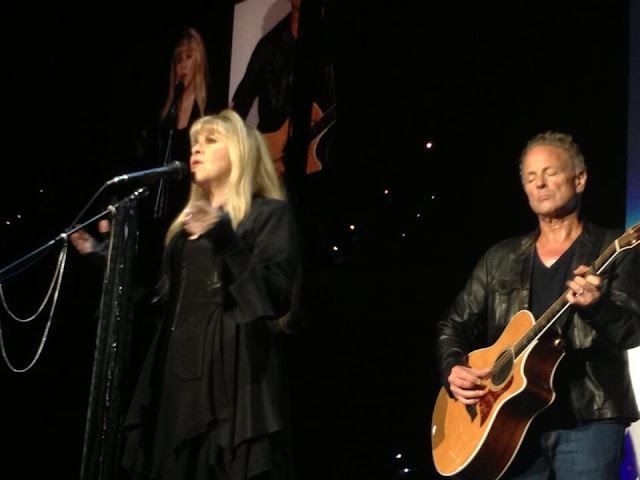 The bond between Nicks and Buckingham was apparent throughout the show – she in her trademark uniform of black jagged-edge dresses and scarf-adorned tambourines and he in skinny jeans and black leather jacket – but most obviously during “Sara,” when Nicks laid her head on Buckingham’s shoulder and closed her eyes as he played, and the ever-poignant “Landslide,” which featured the two standing alone center stage. 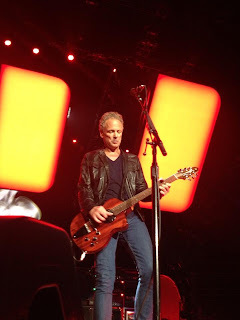 While their dynamic is always a draw, it would be unfair not to underscore the awesomeness of Buckingham’s playing on every song, but particularly “Big Love” – he shook out his right hand before tackling the speedy chord changes in the song – and “I’m So Afraid,” which was raw and explosive. And Buckingham knew he nailed it. 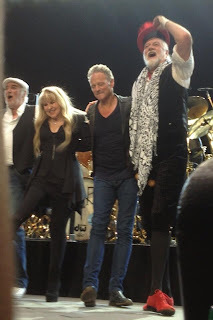 By the time Fleetwood Mac – augmented by two musicians and Nicks’ two backup singers – started to wind down with the sunshine-and-rainbows anthem “Don’t Stop” (Nicks handled McVie’s verses), it became apparent that while the band can be dark, they’ve always found a flame of hope to guide them. For anyone paying attention to Stevie's and Lindsey's stage costumes this tour, it's remained pretty much static the entire tour thus far except for tonight Stevie began the show in the frilly dress she's worn on previous solo and Mac tours. Then eventually she changed into the 2 outfits that she's been ending the tour with. I was there, and you said it all for me! Me, my mother, and my sister went to the Atlanta concert. If anyone had told me that they could sound better than they did on the Rumours album, I would have never believed it, but it is so true. They were absolutely phenomenal!! It was a true once-in-a-lifetime experience for us all!! I have to say that this particular review was one of the best written so far this tour. The author actually watched the show... Bravo!! How rare!! Reviews gave been amazing, especially the past coupla weeks. Glowing even...and not one hater in the house? My husband and I were at the Atlanta concert and it was amazing!!!! He saw them during the original Rumors tour and I had seen them back in 2009, but being able to see them together was a wonderful experience that I will never forget! They are now and always will be the Classiest Rock band of all time!! !